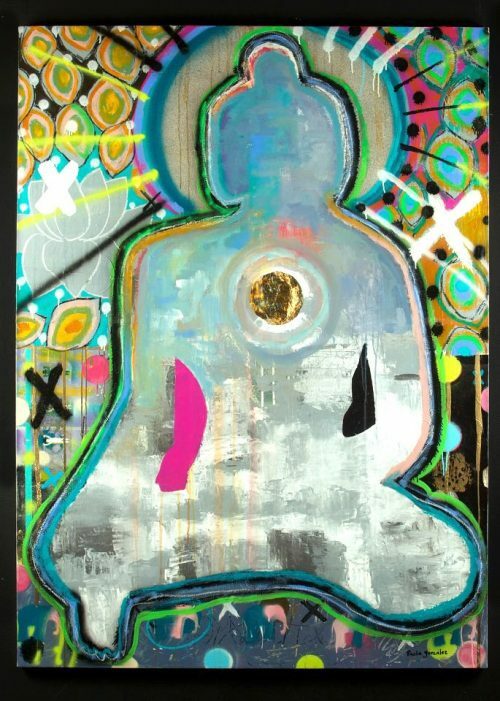 Zazen, 120 X 180 cm, Acrylic, Silver leaf, White Quartz & Opa, Copyright 2017. 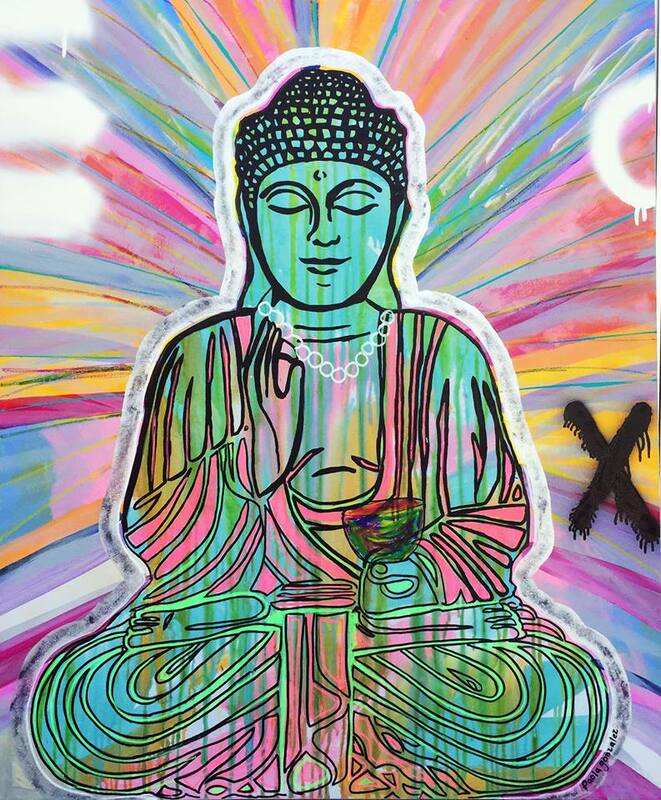 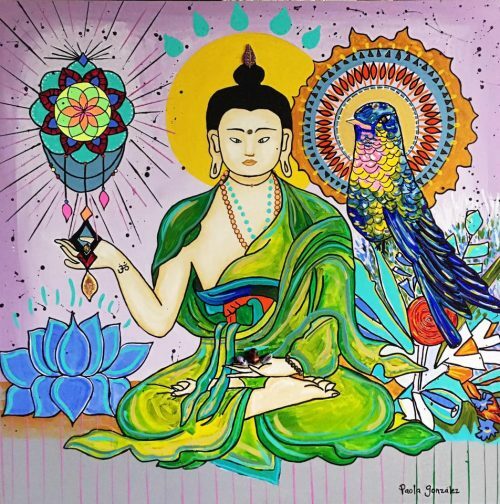 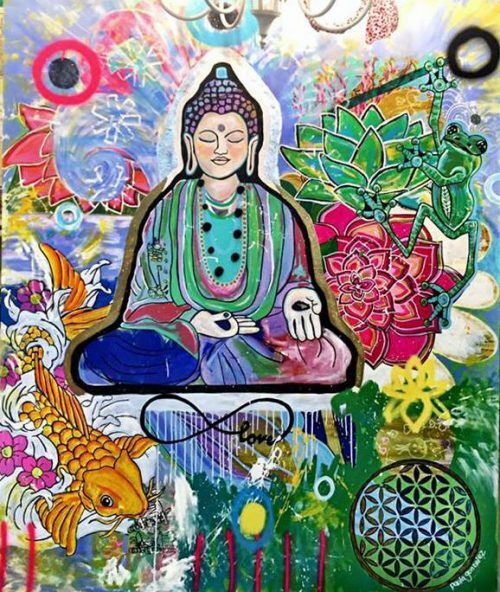 Shanti Buddha, 130 X 210 cm, Acrílico, Mixta. 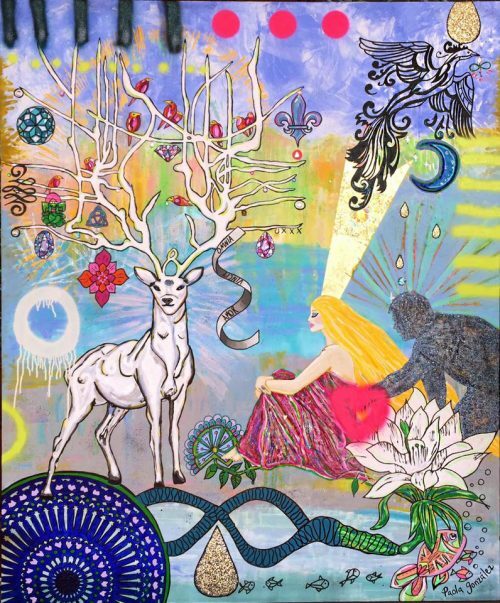 The Lovers and the Blue Deer, 155 cm X 185 cm, Acrylic, Golden Leaf, Mixed Media, Copyright 2016. 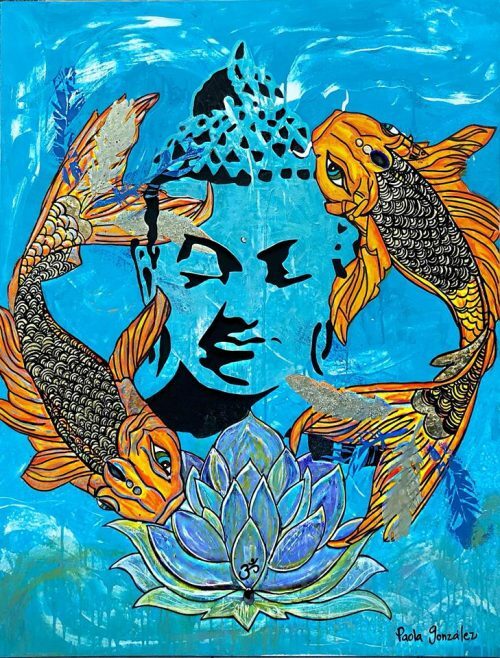 Sacred Water- Buddha’s Koi, 100 X 130 cm, Acrylic, Gold Leaf, Quartz, Agates, Mixed Media. Dharma Buddha, 155 cm X 185 cm, Acrylic, Quartz Stones, golden leaf, mixed media, Copyright 2016. 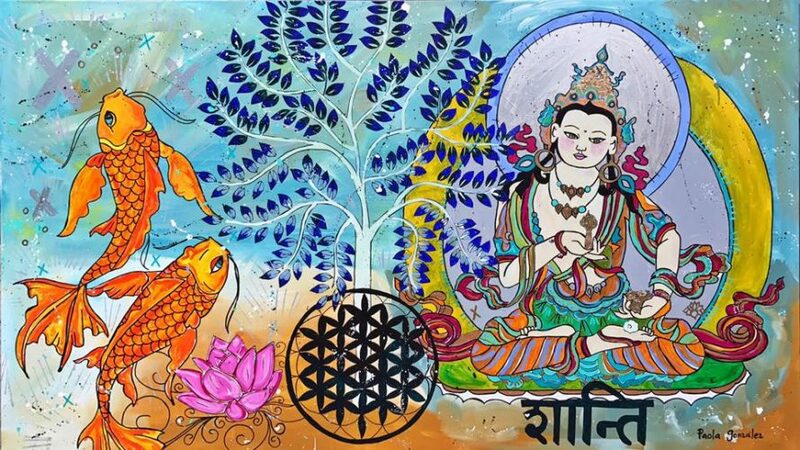 Buddha -Star Seed, 141 X 221 cm, Acrylic, Agate, Quartz, Mixed Media. 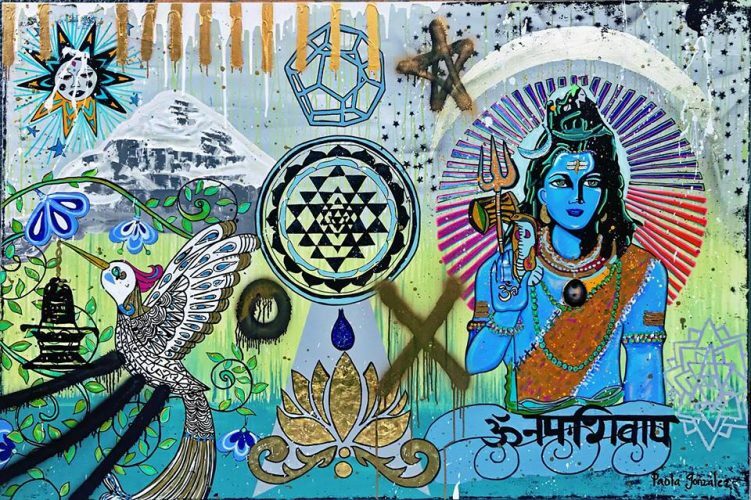 Lord Shiva, 120 X 180 cm, Acrylic, Silver Leaf, White Quartz, Agate, Mixed Media. 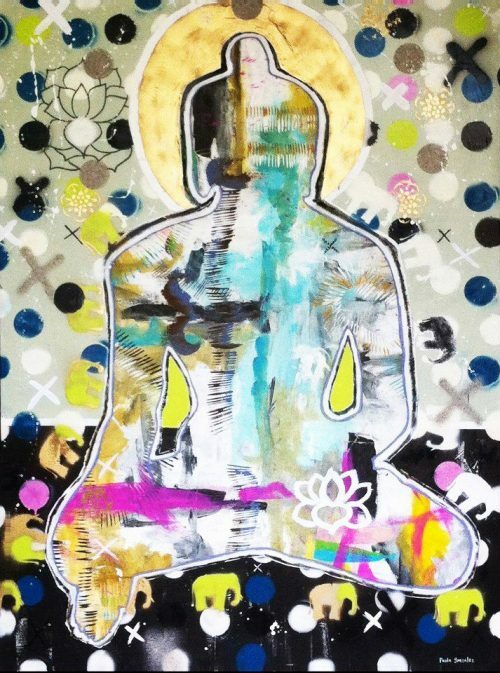 Hamsa Buddha, 155 X 185 cm, Acrylic, Quartz, Gold and Silver Leaf, Mixed Media. 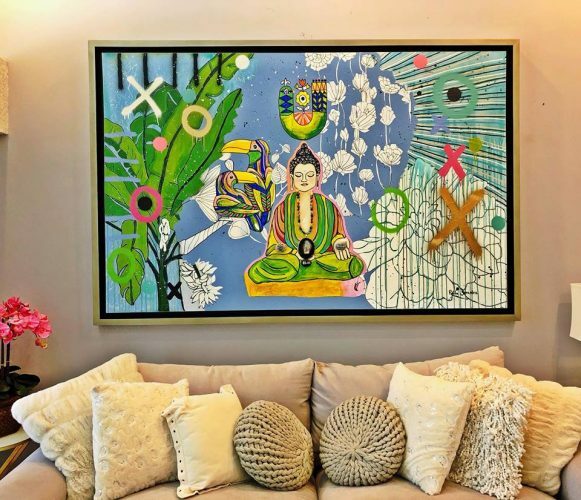 Lord of Light, 100 X 150 cm, Acrílico sobre hoja de plata, Quarzo Blanco, Ópalos y Cristales. 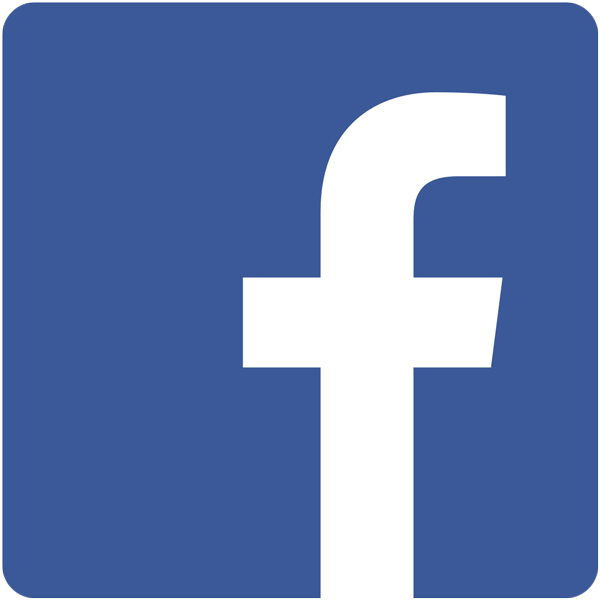 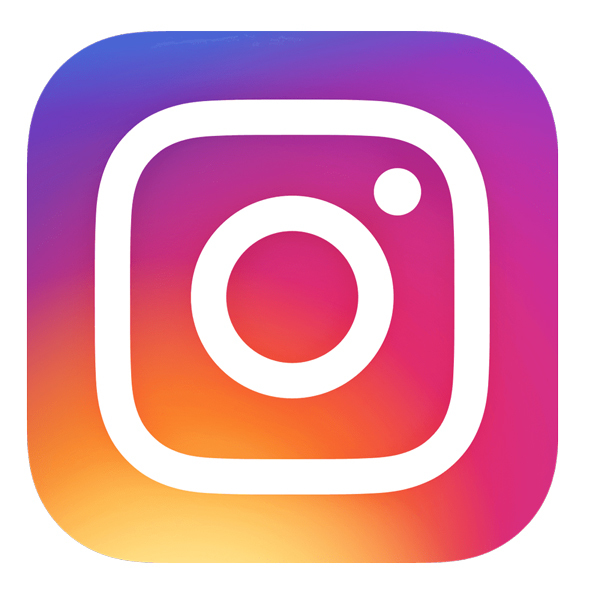 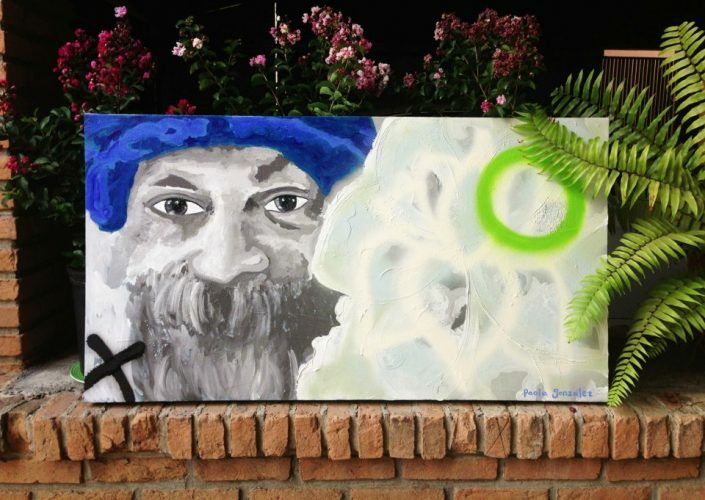 (Incluye el Marco, Cualquier Color), Copyright 2016. 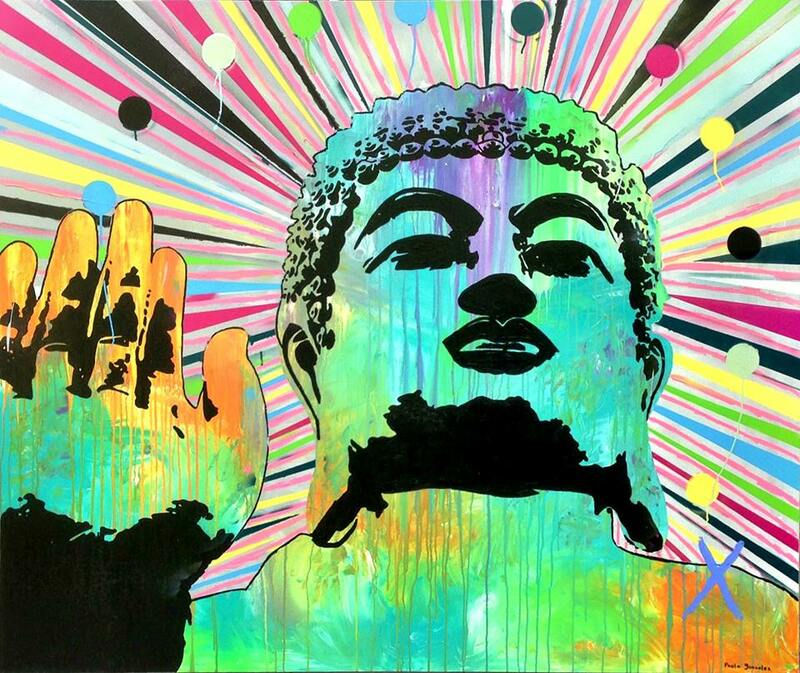 Buddha -Star Seed, 141 X 221 cm, crylic, Agate, Quartz, Mixed Media. 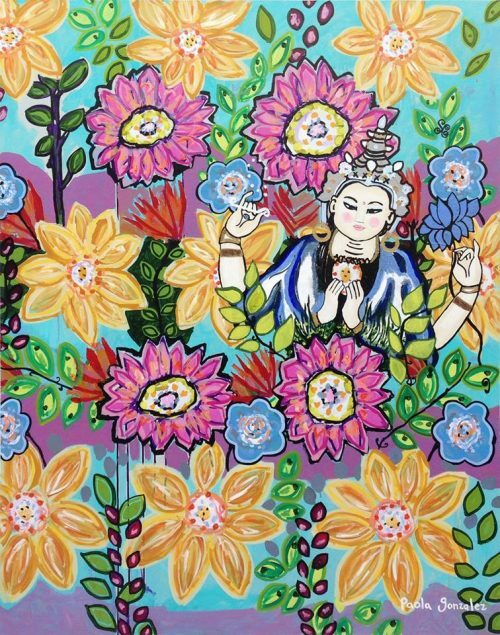 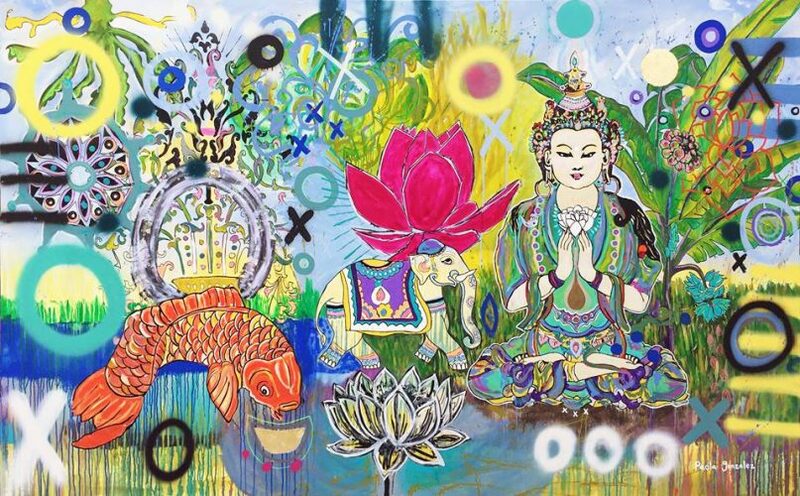 White Tara - Goddess of Compassion, 100 cm X 130 cm, Acrylic, Mixed Media, Copyright © 2014. Buddha. Oneness, 110 X 110 cm, Acrylic, Quartz, Gemstones, Mixed Media. 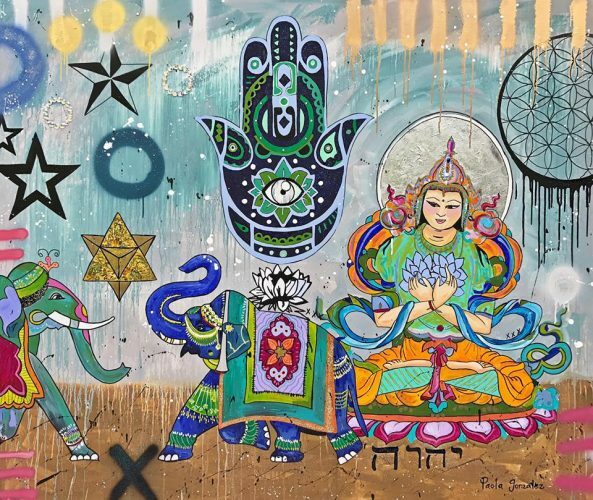 Infinite Freedom, 155 cm X 185 cm, Acrylic, Silver Leaf, Crystals, Orgonite, Copper, Mixed Media and (various symbols of protection), copyright 2015. 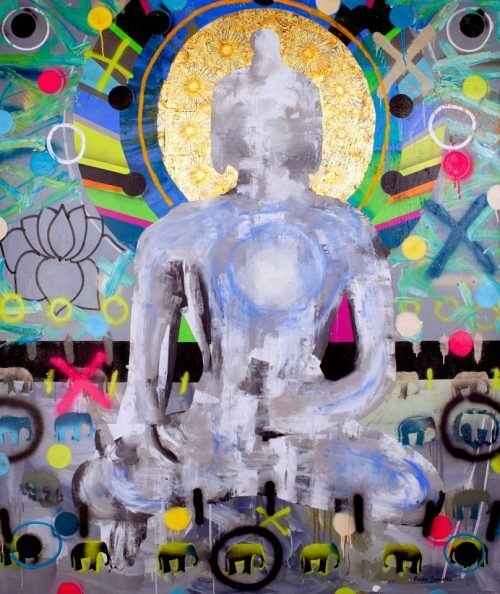 Buddha, 155 cm X 185 cm, Acrylic, Mixed Media, Copyright 2015. 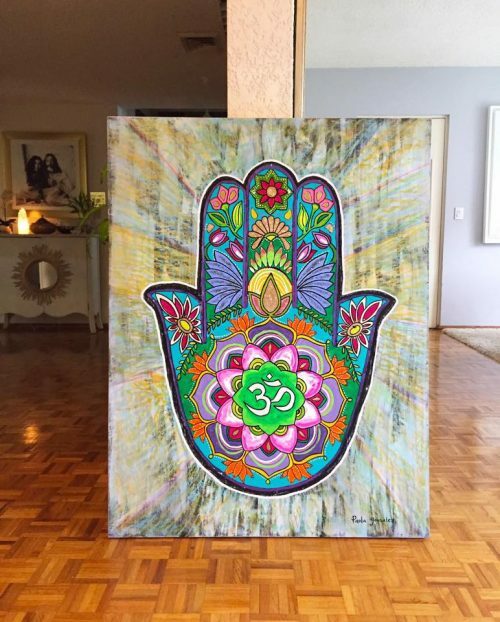 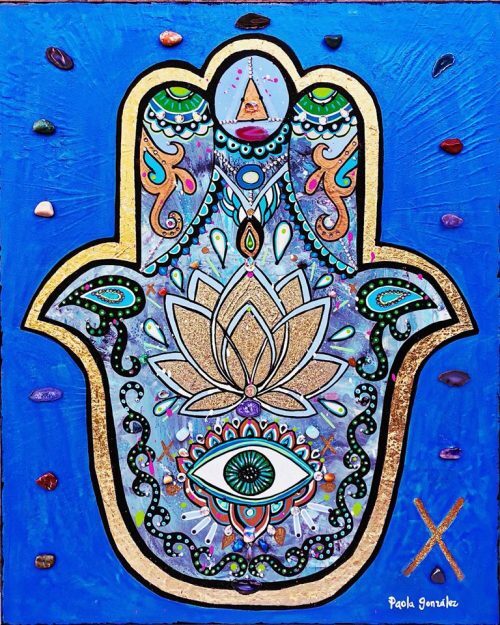 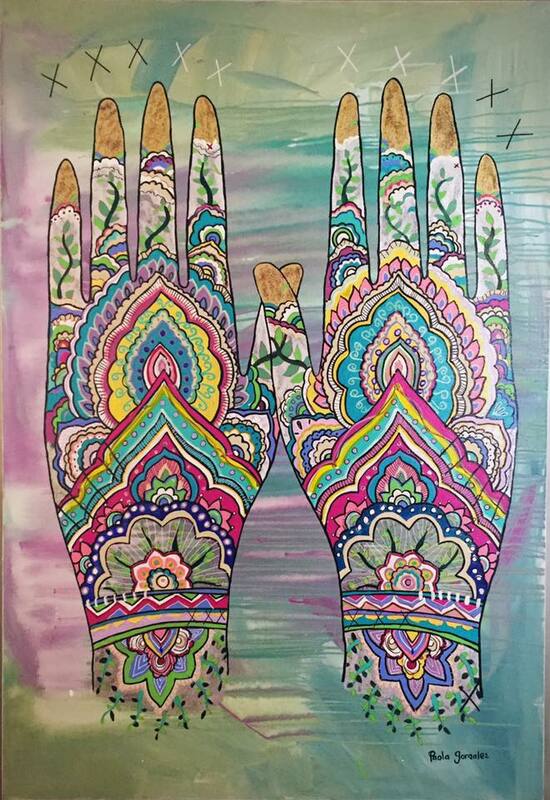 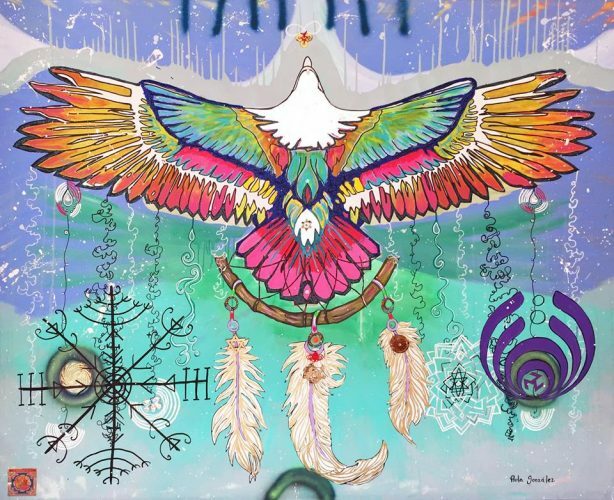 Nirvana Hamsa Hand, 100 X 110 cm, Acrylic, Quartz, Opal, Crystals, Mixed Media. 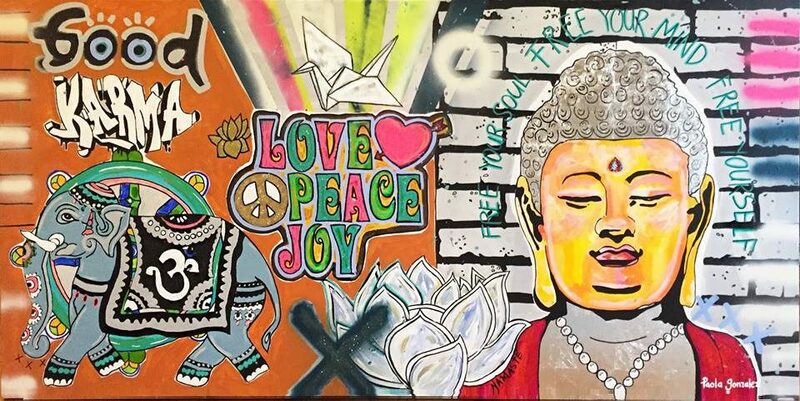 Good Karma, 100 cm X 200 cm, Acrylic, Silver Leaf, Mixed Media, Copyright ©2016. 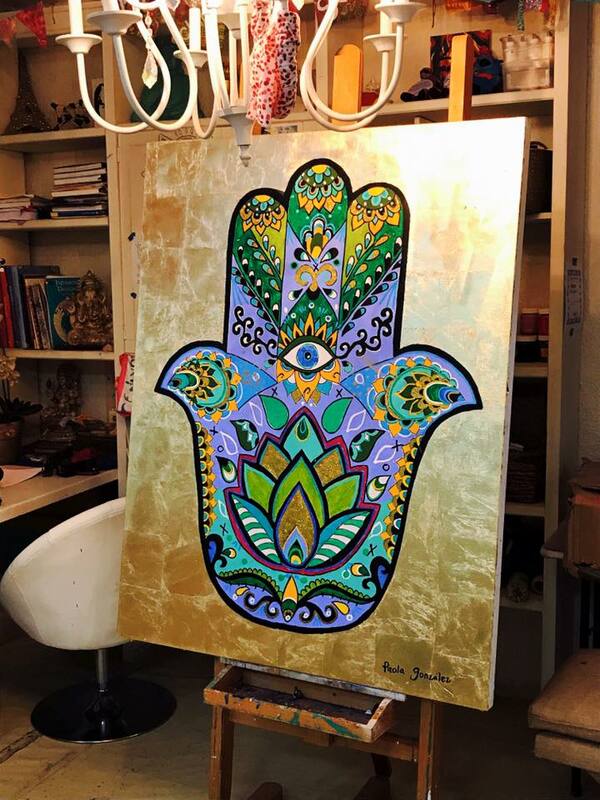 Hamsa Hand Royal, 83 X 103 cm, Acrylic, Gold Leaf, Quartz & Crystals. 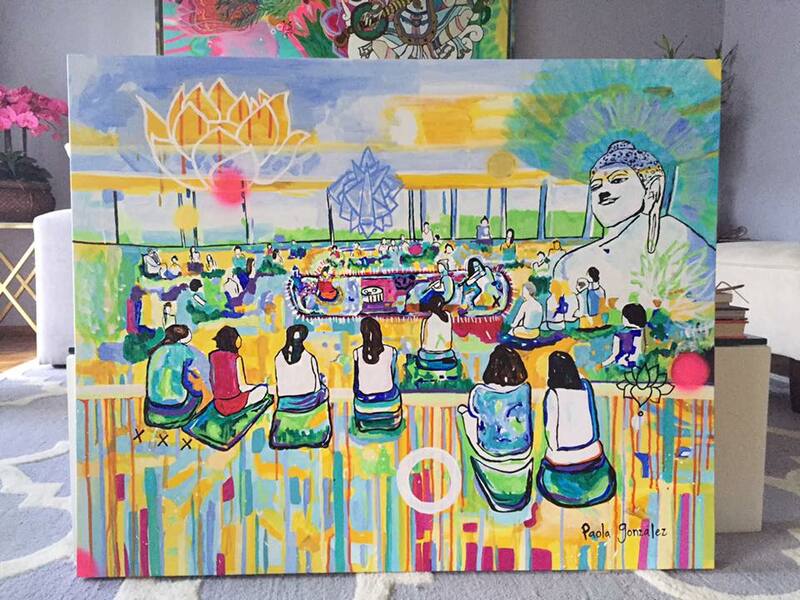 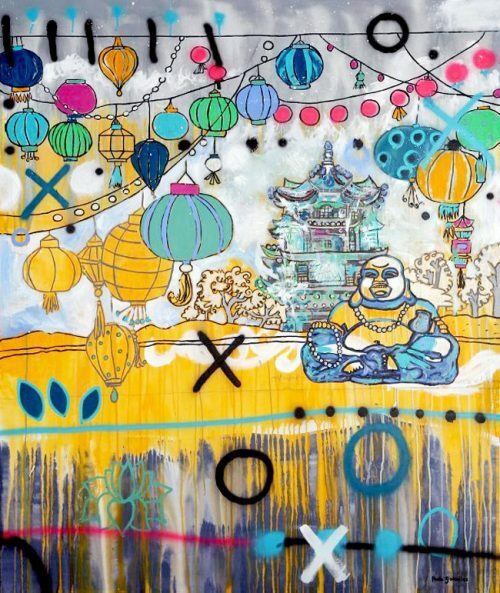 Laughing Buddha Celebration, 155 cm X 185 cm, Acrylic, Mixed Media. 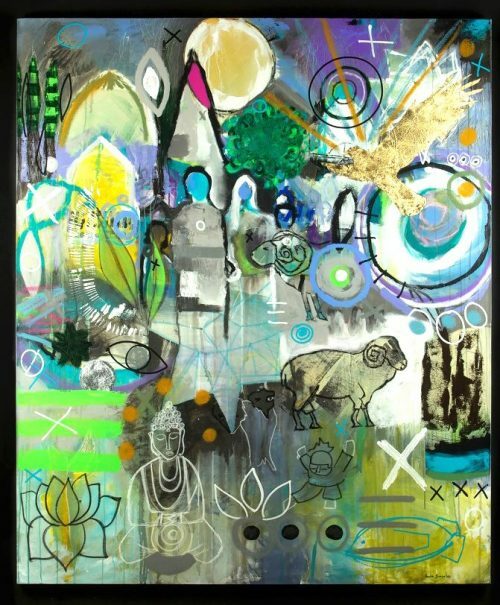 The Village, 155 cm X 185 cm, Acrylic, Golden Leaf, Mixed Media, Copyright ©2012. MARAKAME, 155 cm X 185 cm, Acrylics, Mixed Media. 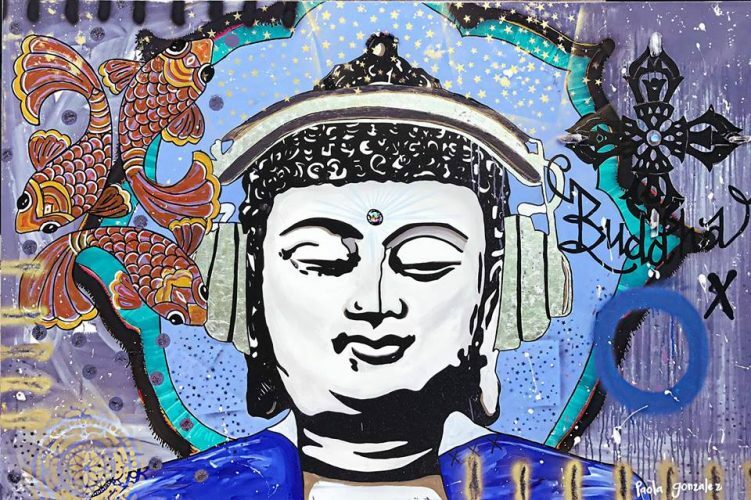 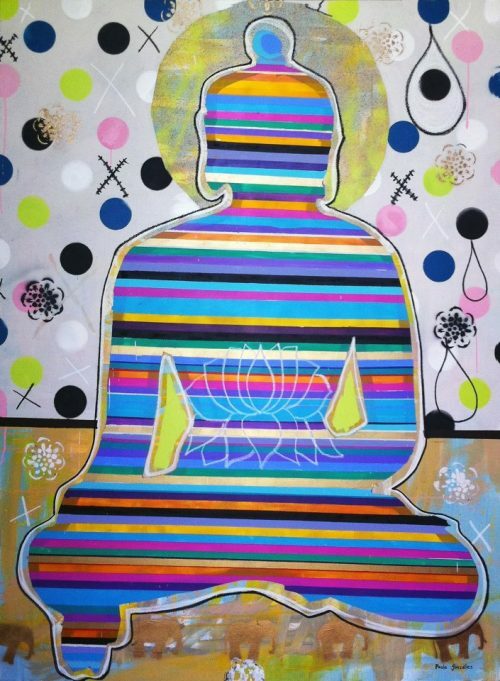 Buddha Amitayus- The Buddha of Infinite Life, 155 cm X 185 cm, Acrylic, Gold Leaf, Mixed Media (Glow in the dark Buddha´s Anahata Chakra), Copyright © 2013. Medicine Buddha, 120 cm X 180 cm, Acrylic, Mixed Media, Copyright © All Rights Reserved. 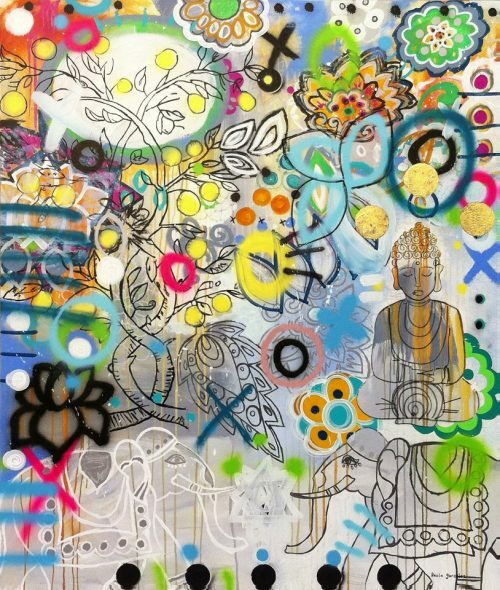 BUDDHA´S GARDEN, 155 cm X 185 cm, Acrylic, Golden Leaf, Mixed Media, Copyright ©2013. Buddha - The Seed of Awakening, 120 cm X 160 cm, Acrylic, Mixed Media. 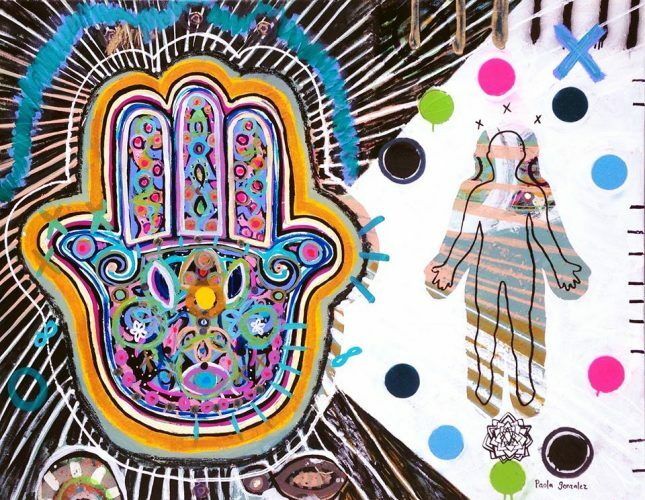 Hamsa Hand - Malkuth, 110 cm X 140 cm, Acrylic, Mixed Media, Copyrigh © 2014. 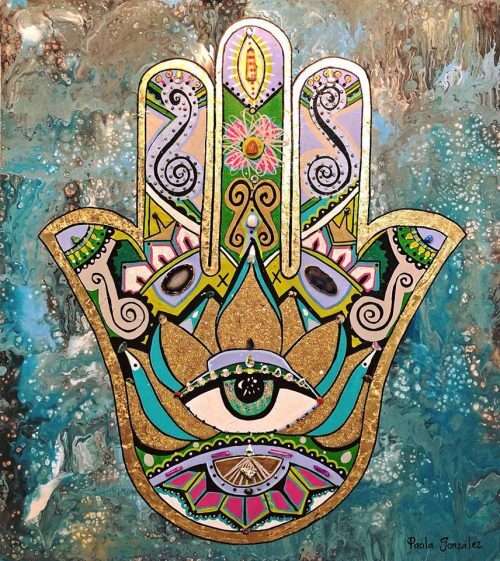 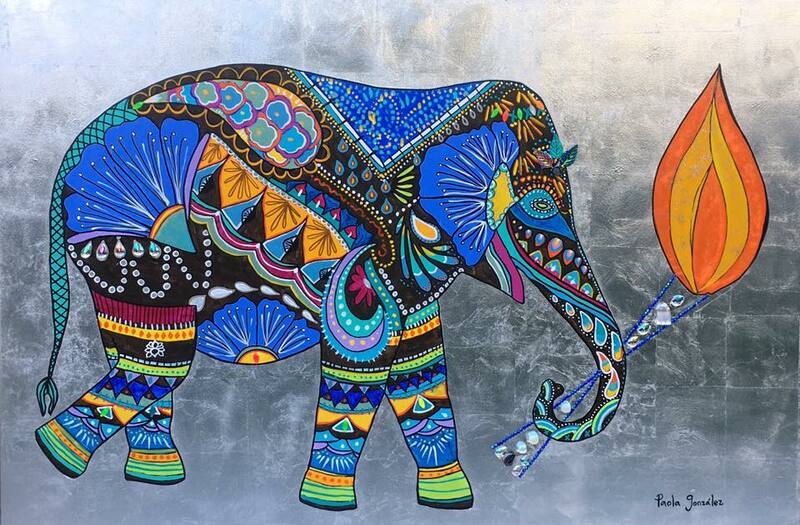 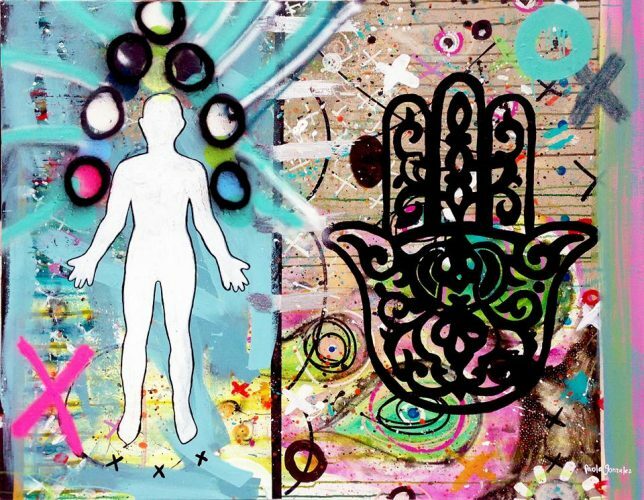 Hamsa Hand - Keter, 110 cm X 140 cm, Acrylic, Mixed Media, Copyrigh © 2014. 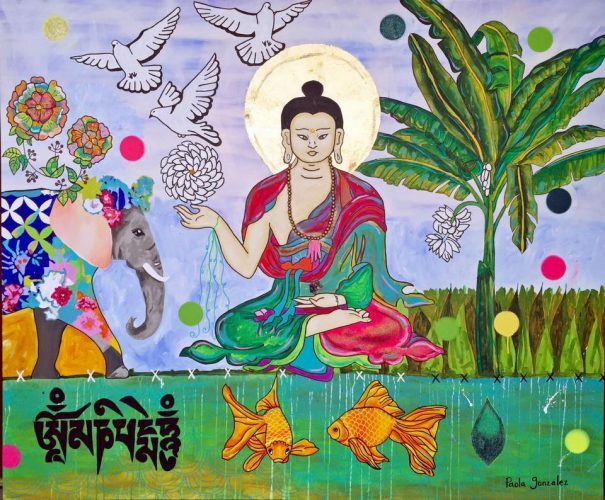 Buddha-The Rising Lotus, 125 cm X 170 cm, Acrylic, Golden Leaf, Mixed Media, Copyright ©2012. 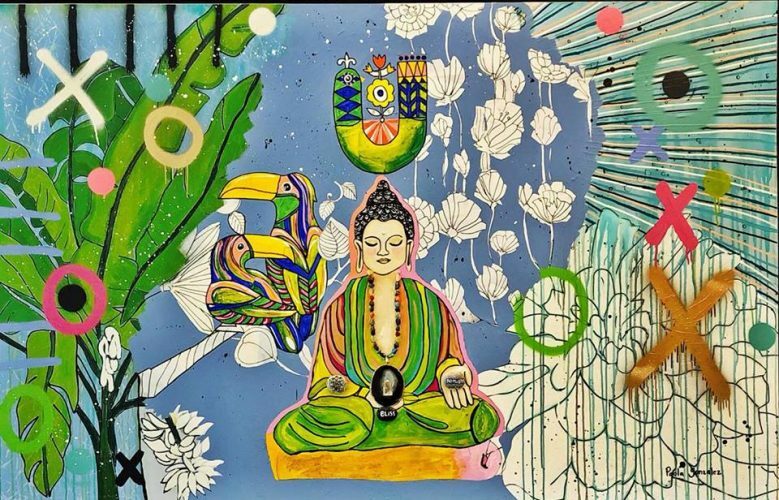 Prashamana - healing energy, 110 cm X 160 cm, Acrylic, Mixed Media, Copyright 2016. Psychedelic Buddha, 90 cm X 110 cm, Acrylic, Mixed Media, Copyright © 2015. 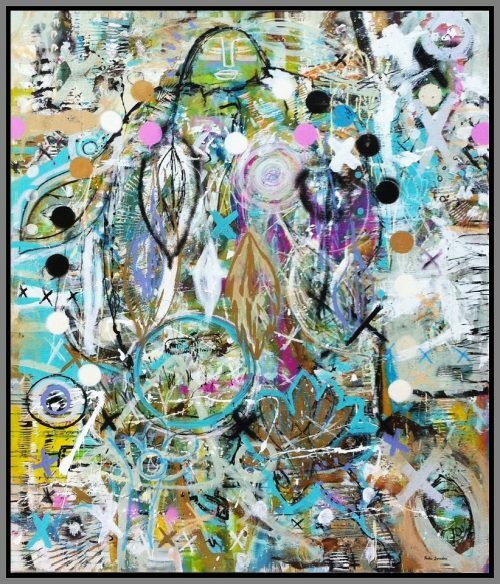 The Magic Room, 100 cm X 120 cm, Acrylic, Mixed Media, Copyright 2016. Hamsa Hand - Lucky Charm, 100 X 130 cm, Acrílico y Lamina de Oro, Copyright 2017. OSHO, 60 cm X 110 cm, Acrylic, Mixed Media, Copyright 2013. 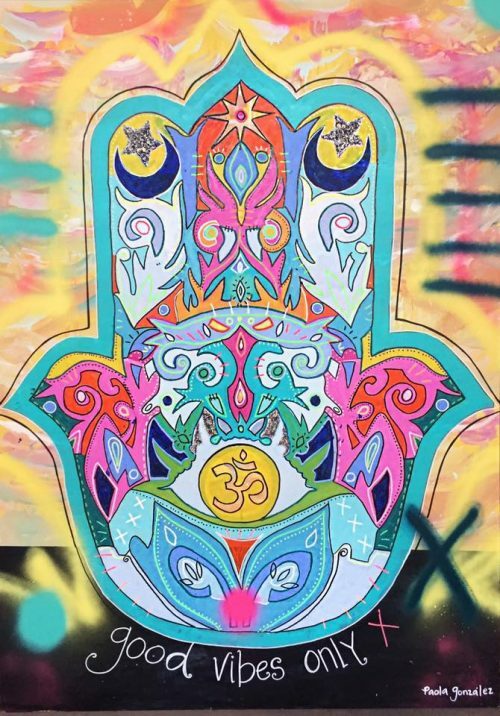 Hamsa Hand Om, 100 cm X 130 cm, Acrylic on Wood , Mixed Media. Good Vibes Only (Hamsa Hand), 100 cm X 140 cm, Acrylic, Mixed Media on Wood Panel, Copyright 2016.